Who knew freeze-dried foods could be less expensive? Only those "geeky" people who love to do the math (that would be me). We all love fresh produce! How many times have you thrown out spoiled fresh produce before you had a chance to eat it? How old is that "fresh" produce by the time you bring it home from the store? 1 week? 2 weeks? More? We usually don't know the answers to these questions, so we take our chances. But seriously, the best time and place to buy fresh produce is from your local farmer and farmer's markets — at the peak of their harvest season. So let's do a little math . . . 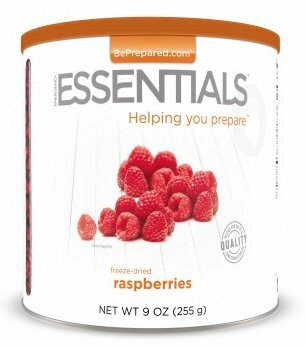 Looking on Emergency Essentials' website on this particular day, the regular price of a #10 can of raspberries weighing 9 ounces was $36.61 (on sale for $32.95). That seems expensive, doesn't it? Yesterday I paid $3.99 for a 6 oz container of fresh raspberries (they were already getting soggy and smashed, bordering on too ripe). So a pound of fresh raspberries at that price would cost $10.64/lb. Much better than $65.08/lb. Right? 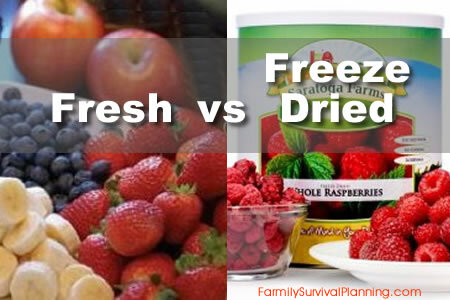 A #10 can of freeze-dried produce is equal to 10 to 20 pounds of fresh produce, depending on the kind of food. For raspberries, one pound of freeze-dried expands to about 10-12 pounds of fresh. So that reduces the price per pound to $6.50 to $5.42 (that's using the non-sale price). Now that doesn't sound too bad, does it? And consider that 10-12 pounds of raspberries is an entire summer's-worth! Rarely do we buy an entire summer's-worth of any fruits unless we're planning to preserve them by freezing, canning or dehydrating. So buying an entire summer's worth of raspberries, that you didn't have to pick or preserve, that costs less than the fresh . . . sounds like a bargain to me. Even better if bought on sale! Wait! There's more to this great bargain . . .
And freeze-dried foods are cleaner — I mean really clean. When you bring home produce from the store or the farmers market, you wash it, don't you? Hopefully, you are able to wash off all chemicals and pesticides. Well, the freeze-drying process cleans the produce much better than we can at our kitchen sinks. Fresh produce has a shelf life of about 3 days. Wouldn't you rather have produce that has a shelf life of 7,300 days (unopened) or 540 days (opened)? I know I would. So before you dismiss freeze-dried foods as too expensive, do a bit of math and see if it's true for the particular food product you want.